Halve the spring onions, set aside. Boil the water. Blanche the spring onion greens for approx. 30 secs., remove with a slotted spoon, cool down immediately in ice-cold water, pat dry. Rinse the fish (inside and out) in cold water, pat dry, place on a baking tray lined with baking paper. Salt the inside of the fish and thinly slice the garlic. Stuff the fish with the reserved spring onions and the garlic. Rinse the limes in cold water, pat dry, cut into slices. 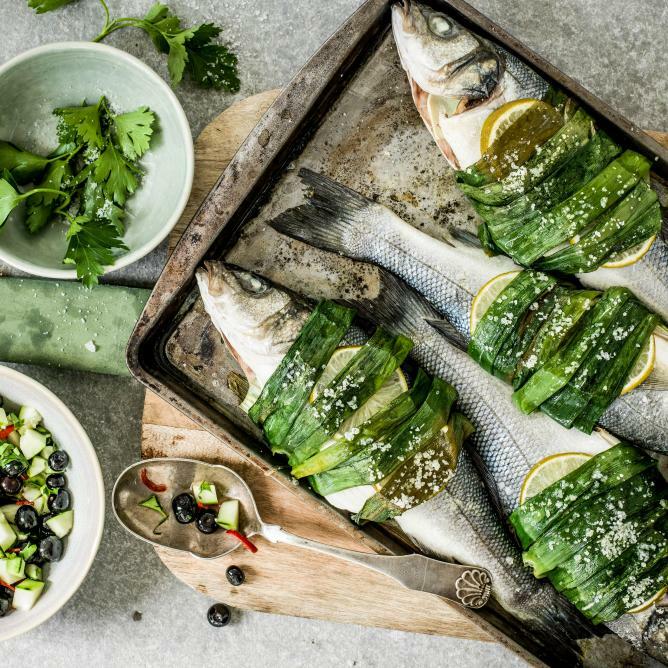 Place the slices of lime on the fish, wrap in the onion greens. Brush the fish with oil, season with salt. Roast the sea bream for approx. 28 mins. in the centre of an oven preheated to 200°C. Remove. Combine the balsamic, oil and fleur de sel. Peel the cucumber, cut in half lengthwise, remove the seeds and cut into small cubes. Deseed the chilli pepper, thinly slice the chilli pepper and parsley. Add the vegetables and blueberries to the dressing, mix and serve with the fish.